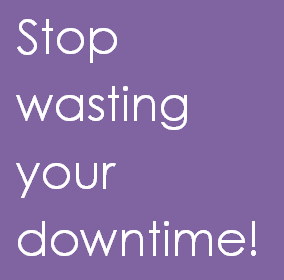 We all have it every once in a while (that includes you, busy-braggers) (you know who you are): downtime. And while we may not admit it, we’ve all passed that time with mindless activities, be it chatting with coworkers about nonsense, perusing Facebook until our eyes burn, or scoring some sweet (unnecessary) deals from our favorite online retailer. But as a young professional – especially one looking to stand out in their career field – how can we better-fill that downtime? How can you see it less as a detriment and more as a chance to grow? Here are some ideas that have worked for me. Pro Tip: Subscribe to your favorite new sites’ email newsletters! Then you don’t have to hunt. Notice I didn’t just say “LinkedIn Profile.” While I’ll never bash perfecting your profile, LinkedIn has even more than that to offer. Check out Pulse (under Interests) for articles related to your interests and industry. Follow companies you care about to stay up to date on their posts. Engage with clients, colleagues, and others in your network to grow your presence. Follow industry influencers to stay knowledgeable. Pro Tip: Make sure you’re not viewing profiles anonymously, and then view with purpose. LinkedIn notifies users when someone views their profile, so if you’re looking to show up in someone influential’s notifications, it’s a good, non-invasive way. Grow as a social media professional. When I first started in the world of marketing, all of my social media accounts were for personal use only. And that’s not to say I was posting inappropriate pictures or vulgar statuses all over, but I simply wasn’t using social for a professional purpose. Fast-forward 2 months, and I really started to gain an understanding for how I could use social media, specifically Twitter, in a professional sense. So, I decided to create a “professional-only” Twitter account, and I also took the privacy settings off of my Instagram account. Not only do I now use them for connecting with colleagues & clients, but they are now my “window to the world” in the marketing industry. I use them to connect with industry professionals to gain knowledge on industry trends. I use them to connect with others at industry-related events I attend. 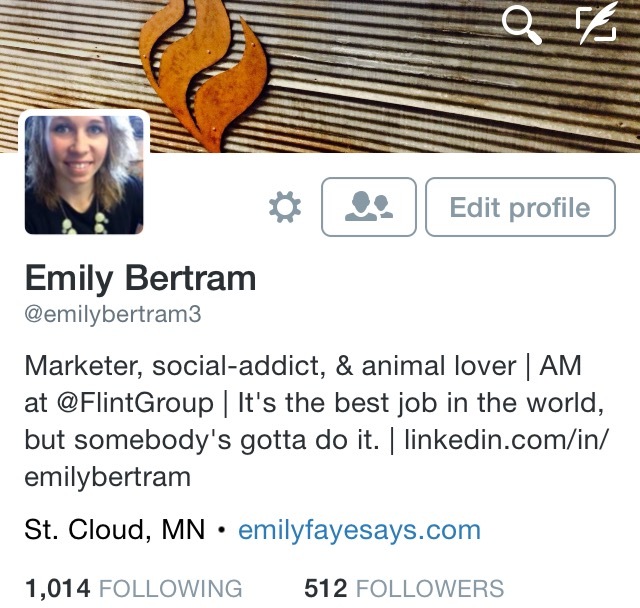 Plus, I love using my Twitter account for industry “chats” (specifically #AdweekChat). While I don’t devote every waking second to them, I do take advantage of downtime to update my profiles, find interesting things to share, discover new people to follow – you get the picture. Pro Tip: While you should always keep a professional tone on your professional social media accounts, it’s okay to be silly/fun. Don’t sound like a robot – make jokes, comment genuinely, and, well, be a human! Go above and beyond for your client/company. This might already be expected, but often times we’re too busy to devote time to it and then forget when we actually have time. Think about it: how can you go above and beyond to either wow the client or improve things within your company (or department)? Devote 20 minutes or so during downtime to thinking up “free ideas” for clients. Or spend 10 minutes chatting with coworkers about a certain work process to see how others feel it could be improved. Who knows, you might just come up with a big solution! Pro Tip: Regularly block out time on your calendar for brainstorming. Good ideas often come from a flowing thought process, so avoiding interruptions can make for the best results. & when all else fails… take a break. Pro Tip: If a walk isn’t your thing, offer to make a coffee run to a local Caribou or Starbucks. Ask your coworkers if they want anything. Not only will it get you out of the office for 15 minutes or so, but you’ll be delivering smiles (& caffeine) to your coworkers – win/win! What do you do with your downtime? How do you stay busy? Share your tips in the comments! & as always, thanks for checking out what #EmilyFayeSays! As part of my never-ending quest to be a networking-maven, I joined a group called NEXT St. Cloud about 7 months ago. NEXT is a networking & professional development group meant just for young (under 40) professionals. We meet once monthly for an hour, and each meeting consists of lunch, group updates, and a presentation on some relevant topic. Topics range from leadership to career advice to city development and beyond. This week, the topic was about how to use the social sites Twitter & LinkedIn in your professional career, prepared by the @FlintGroup team and myself, & taught by yours truly. I’m extremely passionate about social media, and a strong believer in building your personal brand if you’re in the professional services realm at all. Twitter is my happy place (Lord help me) and LinkedIn is my water-cooler. So, naturally, when I was asked by leadership to give a talk about these two networks, I happily obliged. 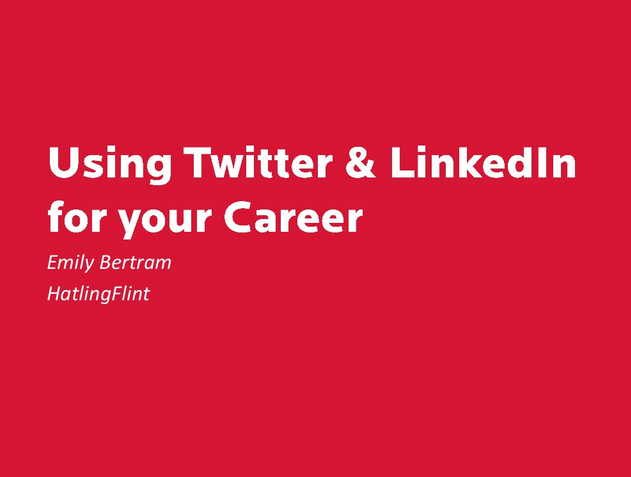 Here is a link to the presentation if you’re interested in skimming all 32 slides: Using Twitter & LinkedIn for your Career. And I also want to give a MAJOR shout-out to my colleague & friend @britthanso who helped me prepare this presentation! While sharing others’ content is a great way to start and fill in gaps, it’s even more fun to share your own thoughts/feelings. Share what makes you happy. Live-tweet and industry event. Post a funny (appropriate) picture. People follow you for what you have to share – so share it! Be helpful. I’m going to quote the content marketing genius @JayBaer here: “If you sell something, you can make a customer today. If you help someone, you can create a customer for life.” Don’t always be thinking in terms of sales & dollars. Think in terms of relationships and connections. Your customers will remember you for it. When it comes to time spent on social, do what works best for you. Find a reasonable amount of time you can commit to social media, and stick to it. Realize, too, that social is so much more than something you do on the side. It’s a new business tool, a networking group and an enormous knowledge base. Take advantage of that. Social media opens doors to millions of individuals around the world. It gives you a chance to rub elbows with big brands, CEO’s, and even celebrities. It should no longer be treated as a “side project” for your career – it’s a must. What works well for you in your industry? What do you think doesn’t perform so well? I would love to hear your experiences!